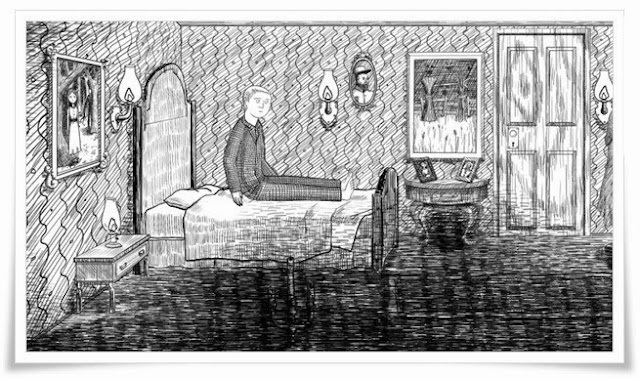 Neverending Nightmares is the upcoming indie-horror by Infinitap Games, and takes influences from a number of different places. Frankly, one of those places must be hell, because this game is as disturbing as it is scary. I loved it. The first thing you’ll notice when you load up the demo is the extremely unique art style, which looks like a child’s drawing; Possibly drawn by one of those terrifying Asian children from The Grudge. Everything has a pen-scratched quality to it, and it felt like I was tip-toeing across a sketchbook. This design choice was influenced by Edward Gorey, an American writer and illustrator known for his unsettling Victorian and Edwardian style stories and drawings. Gorey. The artist of your nightmares. This style lends much of its disturbing nature to the demo, as I often felt as if the world was closing in on me with the scratches of a cruel artist’s pen. Much of the demo is black and white, except for two things. Interactive objects… and blood. Naturally, this means that the player’s eye is drawn to them. The blood, in particular, is almost too much in the monochrome setting, but it’s something that you’ll need to adjust to, and quickly. The title of the game is especially fitting for two reasons. Firstly, because it’s something you’ll experience after playing the demo, and secondly, because of how the game makes you feel every time you ‘die’. I use the term loosely, as there doesn’t seem to be any real death or failure in this game. The few times I ‘died’ - in the darkness, sweaty and panic-stricken – I awoke back in my bed, where you begin the demo. A lumpy mattress is my idea of a nightmare. As someone who likes to over-analyse every single part of life, I couldn’t help but also think about how this gameplay mechanic might be a reflection of the depression that Gilgenbach is trying to express. For example, imagine walking through each day waiting for something awful to happen to you. You’d mistrust everything and everyone around you, thinking they want to hurt you – which was certainly how I felt during the demo. Then, the next day, you wake up, and realise that you have to do it all over again. I’ve never experienced depression for myself, but Neverending Nightmares had me trying to understand the mental illness further, which is something that needs to happen more in gaming – and in all forms of media. At least now he has two pairs of pyjamas. Even without its deeper meanings, that will no doubt enhance the game, the demo of Neverending Nightmares offers a disturbing and jump-scared filled experience. 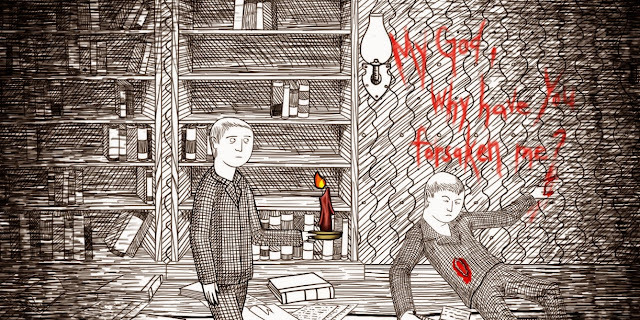 The Gorey-inspired art style, eye-catching gore and many forms that horror takes throughout mean that this is one of my most-anticipated indie scares. Though it’s Kickstarter project is long-since funded, you can still back the project, receive your deserved goodies and scare yourself silly here. Have you ever thought that Nintendo’s Smash Bros. would be even better with elements of horror, steampunk and RPG thrown in? Me neither. But now that it’s happening, don’t you think it just makes sense? I know I do. Such is the basic concept of zGames (the development studio) and APPSolute Games (co-investor, co-producer and publisher) upcoming 3D online multiplayer fighting game for release on iOS, Android, Nvidia Shield and Ouya. As much as I’d love to tell you about the game, there is no-one better to do that than those developing it, and so I have stolen a description straight from the Kickstarter page… It’s not laziness, it’s modesty. Or something. 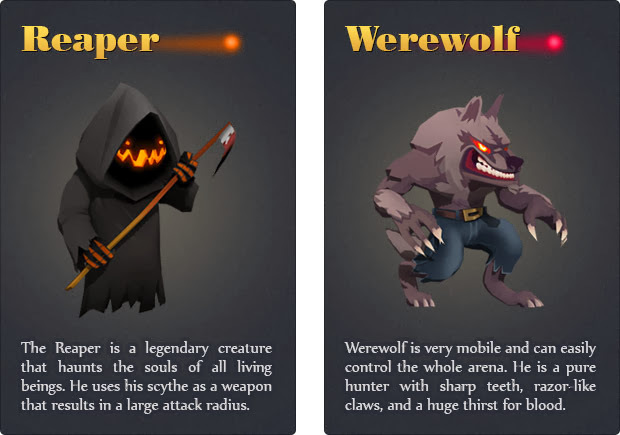 “Fright Fight is a multiplayer brawler infused with rich RPG system elements. On iOS and Android based devices, it will be free to play and uses a unique gesture control system (no buttons!). On OUYA, it is a fully-paid game and makes a perfect multiplayer controller party game. Fright Fight features a bunch of characters from different realms, each with unique attack types, combos and skills. The epic battles full of special moves and fight effects will take place in several different worlds (each with 3 arenas), starting with Flotsam Islands and followed by Galactic Graveyard and a Monster Mausoleum as part of our ambitious plans. 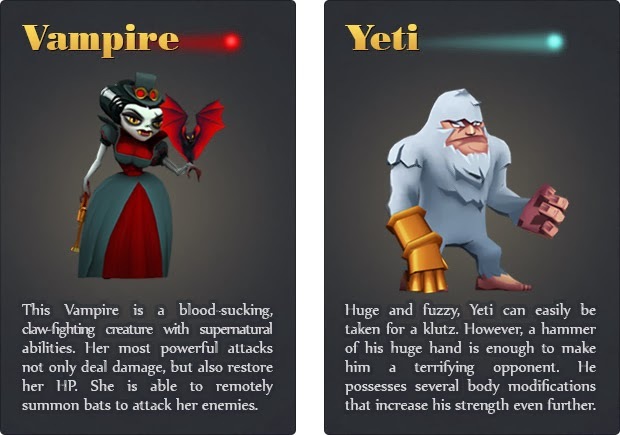 The ‘bunch of characters’ mentioned are currently the Vampire, the Yeti, the Werewolf and the Reaper, but if stretch goals are reached there will be more characters (and arenas added) over time. There are more juicy details on these additions in the interview at the bottom of the article. Basically, Fright Fight will be a free iOS and Android game that offers a horror twist on the fighting template put forward by Smash Bros. For me, who has spent countless hours fighting my friends on Nintendo’s beloved series, this is a good thing, and I will be awaiting Fright Fight’s estimated early-2014 release with much anticipation. Whether you download the free game, or pay for the Nvidia Shield or Ouya versions, when we find ourselves on the mythical horror arenas, don’t hesitate to use your sharp claws, teeth or scythe to win, because I certainly won’t. Where did the idea for Fright Fight come from? The idea for Fright Fight came about a year ago when we noticed the lack of fighting games in the mobile gaming marketplace. Our idea was to create a game that would allow players to invite their friends to matches or play against random opponents for quick, on the go gameplay. There were very few games that had the real-time multiplayer capability, and we wanted to bring a new type of game that has yet to be seen on the App Store. The responses have been fairly positive so far. People seem to be interested in the game and the feedback has been positive for the most part. The game is still a work in progress and we have been busy correcting various bugs and stabilizing the game. We are excited to finally start getting real user feedback in the near future. I love Smash Bros., and love the idea of a game that takes this concept and places it into a horror setting. But in what ways would you say your game differs from Nintendo's series? Fright Fight is inspired by Super Smash Bros, but is a completely independent game with inspirations from many different games. The Devil May Cry series served as additional inspiration for some of the battle mechanics, the Diablo series for the RPG elements, the Pokemon series for some gameplay elements and RPG mechanics, Awesomenauts for some of the gameplay elements, world/level design, and art style. A lot of other games have minor influence on the game: Marvel vs. Capcom, DOTA, Quake III, etc. The list could go on forever. I would say that my favourite character to play with is the Vampire. She is a very unique character and has abilities that separate her from the rest of the cast. Her speed and ranged attacks make her an interesting opponent in the arena. If your stretch goals were reached, do you have any idea what kind of extra arenas and characters might be added? Yes we have plans to include two new Arena Worlds called the Galactic Graveyard and Monster Mausoleum. 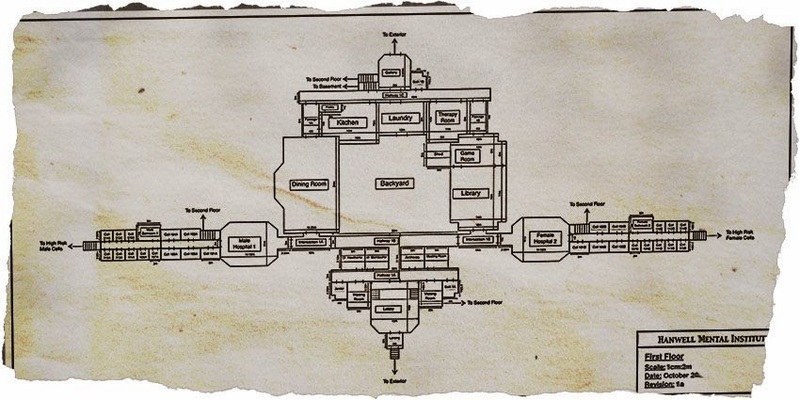 Each world has 3 arenas, in which the platforms are rearranged and new features are introduced. In terms of characters we have concept sketches for a Ghost, Zombie, Alien, and Cyborg characters. We hope to introduce new characters and arenas in future updates to the game. Do you think Kickstarter has changed the way that indies like yourself approach game development? Kickstarter is an interesting tool that indie game developers should attempt to take advantage of. It serves as a platform where developers can share their ideas with the community and see if the project piques the interest of the gaming world, before investing a lot of time and money into the project. I have also seen game studios raise funds from Kickstarter to fund the majority of their development process. For us we came to Kickstarter much later in our development process and are trying to utilize Kickstarter in order to add some key features to our game. Is there any release date for Fright Fight yet? No concrete release date yet, but we hope to release the game before the end of the year. A more realistic release date would be in the first half of January 2014. And finally, as Noble Gaming is a horror-gaming blog, I have to ask, do you have a favourite horror game? I would have to say the Resident Evil series is probably my favourite horror game series. I also enjoyed Condemned for Xbox 360. The Fright Fight project on Kickstarter has 16 days left to reach a goal of $50,000. If you want to check it out, and maybe pledge a little to make sure that this horror-fighter is a reality, go here. Home is the first game from indie-developer Benjamin Rivers, and it is the most ‘indie’ of all the games I have reviewed thus far. However, it uses this to its advantage, and Rivers has managed to create a tense, mysterious experience that can be completed in around 1-2 hours, but stays with you for much longer. Home keeps things simple. The arrows keys are used to move, ‘E’ is used to interact with objects and the ‘Y’/’N’ keys are used to make choices throughout the game. These choices are seemingly the only way to progress at times, such as ‘Do you want to pick up this rope?’, which could have also been asked as, ‘Would you like to climb down a rope, or die?’. However, these choices soon lead to changes in the character’s thoughts. For example, during the final moments of the game, the character summarises the entire mystery that you have just worked to uncover, and gives his opinion on what he found, an opinion that is shaped by your own. Not only this, but your decisions also open up different areas, which adds an incentive for you to return to this short burst of horror in the future. 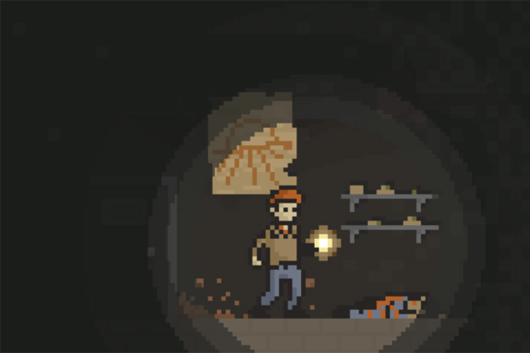 Simplicity is also significant in the visuals of the game, which brings you its tension in pixels. The game doesn’t suffer for this, as the horror comes more from what you don’t see than what you do. Any blood that you come across actually looks a little more akin to Nutella, which is scary too if you consider that it’s considered a healthy breakfast options for kids. Ahem… where was I? From the get-go, the questions of Home had me hooked. You wake up in a stranger’s house, not knowing where you are, or why your head hurts. You’re limping and there’s blood on your shoes. What the hell happened? The only way to find out is to explore the house, which is eerily quiet. You see, Home is also a quiet game. This is not a criticism, but in fact one of its strengths. Every sound, whether it be a door opening, your own footsteps or an unexplained whisper is amplified, and you’ll walk each room in fear the next loud noise. In particular, when wooden doors were replaced with metal doors in a factory, the screech of going through them quite literally turned my stomach, and I couldn’t help but be reminded of a similar feeling I had when playing through Dino Crisis. In addition, such transitions, (e.g. going through doors or climbing stairs and ladders) made me think of early Resident Evil games, which evoked warm, fuzzy feelings of nostalgia. Of course, that nostalgia was tinged with the fear that comes from a well-spent childhood on the streets of Raccoon City. Whether intentional or not, these sights and sounds were digging up past terrors that I thought I’d managed to long since bury. In short, I’ll send you the bill for my therapy, Rivers. Just as I thought: Nutella overdose. As there is no speech in this game – there’s no-one else around, for one - the protagonist’s thoughts are displayed in text, and this is where the real story takes place. The narrative unfolds within this written word, where the main character questions the sights around him and gently directs your thoughts, without ever providing a clear answer to what is happening. Much of this game is left to interpretation, including the conclusion, and as a result I was left thinking about – and discussing – the plot of Home for some time afterwards (despite finishing it at 2am in the morning). Depending on my mood, this outcome switches between refreshing and irritating. 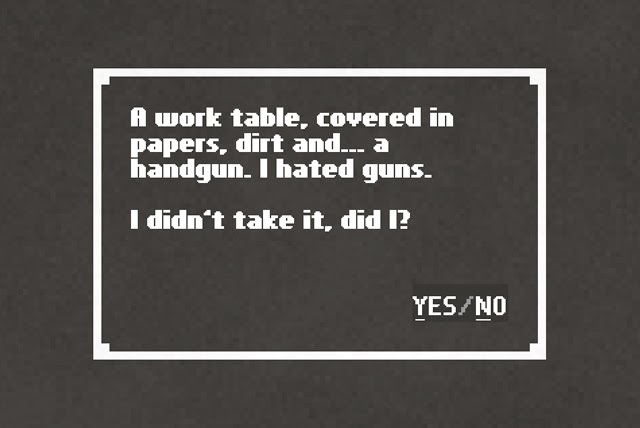 It’s nice to be left mulling a game over for a while after you’ve played it, and shows that you’ve at least connected with the experience on a deeper level, but I also quite enjoy knowing the cold, hard truth. That must be the Professor Layton in me. While I may never know for sure what happened in Home, even days afterwards I still appreciate the constant tension that Rivers is able to create with nothing more than written text and pixels. I realise that these two things are essentially what every game is made up of, but here they are at their most bare, and it works. A good example of this is that after finding a video showing two people killing a sewer worker, I regularly stumbled across objects in two’s. Two chairs. Two sleeping bags. Two water rings. Each pair discovered only made me wonder how far I was from the possible culprits of this bloody, confusing night. Or, even worse, how close they might be to me. My only criticism here is that I would have liked one last scare to release all of this tension, and be led into the open-ended conclusion with my heart beating at an unhealthy speed. In actuality, while searching around the aforementioned ‘home’ I felt that the game dropped its horror element in favour of wrapping up the mystery of the narrative. I only asked you to tidy the basement. Drama queen. 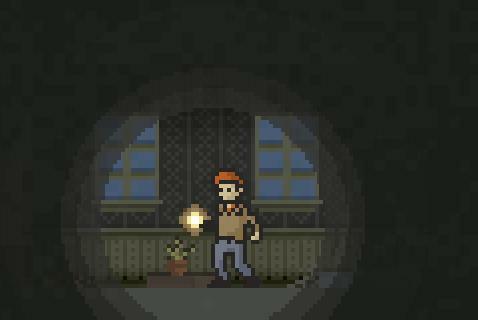 Home shows that a game need not have a big budget or fancy graphics to provide an apprehensive and interesting horror game. 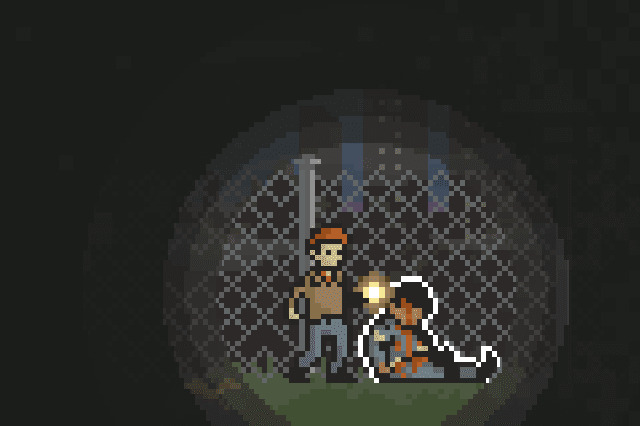 Using only pixels, written thoughts, jump-scares and the exploration of an unexplained and deepening mystery, it builds and sustains a tension that many triple-A titles don’t ever reach. There is a good balance of frights, choices and puzzles up until the conclusion, which felt lacking from a horror standpoint, but served mainly as a thought-provoking finale. Nevertheless, though it was already late when I began playing Home, and had only meant to play into the first half an hour, I ended up finishing the game in one sitting. This shows that the narrative that Rivers has created is gripping, and I’d happily spend more time in a pixelated sweat trying to uncover the mystery of this small town’s murders. Deadlight is a side-scrolling zombie game set in the aftermath of the apocalypse, and is the first release from Madrid-based studio, Tequila Works. I recently purchased it in the Steam Halloween sale, and before I go any further, I have to say it was worth every penny of the £2.49 I spent. It’s now back up to £9.99, which seems expensive in comparison, but is still probably worth it. I mean, it costs that just to breathe nowadays, and I can guarantee that it’s much more fun than that. The world now belongs to the ‘shadows’, which is what Deadlight has lovingly nicknamed its zombies, and you are thrown right into the action. You control Randall Wayne, an everyman who used to be a forest warden amidst Canada’s finest redwoods (they never mention redwoods, but I bet there were some -it’s Canada). At the very beginning of the outbreak, Randall was out collecting supplies when the military came in and escorted everyone to a ‘Safe Point’, at which point he lost his wife and daughter in the chaos. Essentially, the central narrative of the game is Randall’s search for his family, but there are many mysteries to uncover as you progress. A cutscene opens the game, and I was immediately blown away by the different art-styles at work in Deadlight, both unique in their own way. The cutscenes play out like a gritty hand-painted comic book, in which dialogue is spoken over fixed shots of bold colours and thick brush strokes. Though I accidentally skipped one these cutscenes, and the audio disappeared on a couple of others, I always looked forward to the next. Were you going to finish that? On the other hand, the side-scrolling gameplay itself boasts a detailed world shown through a suitably bleak colour palette. This viewpoint, while also freshening up a decaying sub-genre of gaming (did you like that? ), also serves another purpose. With your scruffy silhouette in the foreground, the backdrop is reserved as a constant reminder for the devastation happening worldwide. 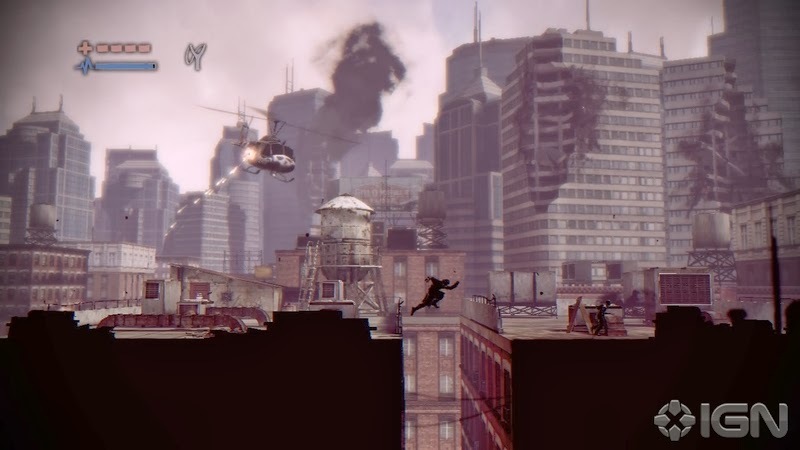 As you traverse the perils of the environments, you are forced to keep one eye on the horizon, where buildings are abandoned and plumes of smoke rise into the sky of the dead city. It is in these little details that the world of Deadlight comes alive, so to speak. Billboard posters flap in the wind, high-rises loom above the rubble, and you’ll occasionally come across people that died and reanimated whilst still locked inside their car. What was their story? How did they get there? And did they have heated leather seats? These are the important questions, and ones that the game had me asking on more than one occasion. Compared to the abundance of run-and-gun zombie games on the market, Tequila Works’ creation has a much slower pace, allowing you to appreciate the world around you. That’s not to say that there isn’t a real sense of urgency throughout, though. This comes from the almost-constant threat of zombies from every angle. Either they lurch towards you from all sides in the foreground, or steadily encroach from the streets, rooms and shadows of the background. Even armed with an axe, each approaching horde had me searching for a way out, rather than wishing to take them head-on. Swinging the axe takes stamina, and this, combined with the undead’s resilience – seriously, even for zombies, these guys can take a hit - means that running is quite often the best, and only, option. After finding a revolver, the scarcity of ammo ensured that the tension remained, never making me feel as if the zombies were little more than targets at a shooting range (See: Resident Evil 5 and 6). With this is mind, imagine how vulnerable I felt when I was forced to trade my axe and revolver for a slingshot during one section. To make it even worse, it also made me feel a little like Dennis the Menace, and let’s face it, no-one wants that kid to survive the zombie apocalypse. I'd heard this was a nice neighbourhood. 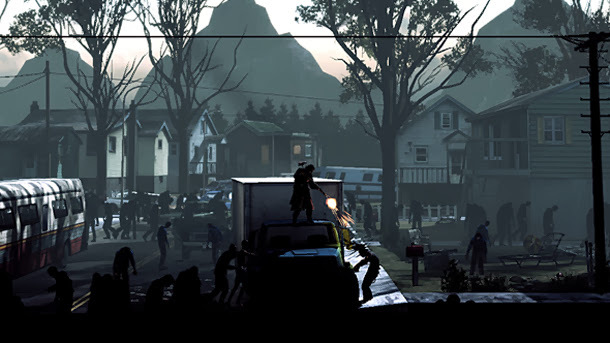 Deadlight’s strength comes from its variety. There are many different environments, numerous puzzles, and countless secrets and collectibles to find. 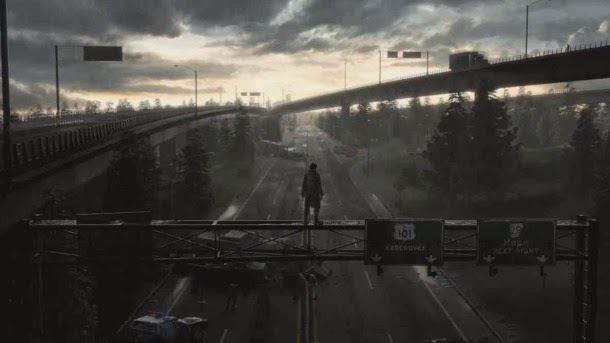 Beginning with the environments, you’ll travel through suburbs, cities, sewers, military camps and, as should always be the way, an overrun hospital. Something I loved is that before you enter a room, it is hidden from view. Until you climb through an open window or kick your way through a door, you’ll never know what horrors hide inside the next four walls. Will you be faced with a group of the undead? Or will you find yet another body swinging from the rafters; someone who couldn’t, or wouldn’t, handle the cruel realities of the new world. Never knowing makes each scenario all the more powerful. Running, climbing and leaping through these locations is fun and smooth, for the most part, and reminded me of mobile parkour games such as Mirror’s Edge and Vector. I have spent far too much time free running my way through each of these, so this was an unexpected, but welcome, comparison. Helicopter tours of the city are a little different now. There were, however, a few issues. I sometimes found it difficult to run (Shift) and roll (Ctrl) at the same time, though this may be due to the majority of my gaming years being spent on consoles, rather than PC. More noticeably was the fact that there was a point when I returned to a room via a higher window and the room stayed hidden. It only happened the once, but if there had been any zombies in that room, I’d have died for sure. As for puzzles, these are relatively simple, but provide enough different challenges to be interesting. Move crates to reach higher ground, turn off electricity to continue without being fried, and drain water from flooded sewers. This last one is especially important as it turns out that Randall has more to worry about than the undead. He also has to make sure that he doesn’t lose his arm-bands, because he can’t swim. For someone who has survived 145 days in the apocalypse, I found this a little hard to believe. He can handle flesh-eating corpses without breaking a sweat, but show him a paddling pool and he’ll have nightmares for weeks. Nevertheless, it’s hard to focus on this for too long when the world has ended, and what an end it is. 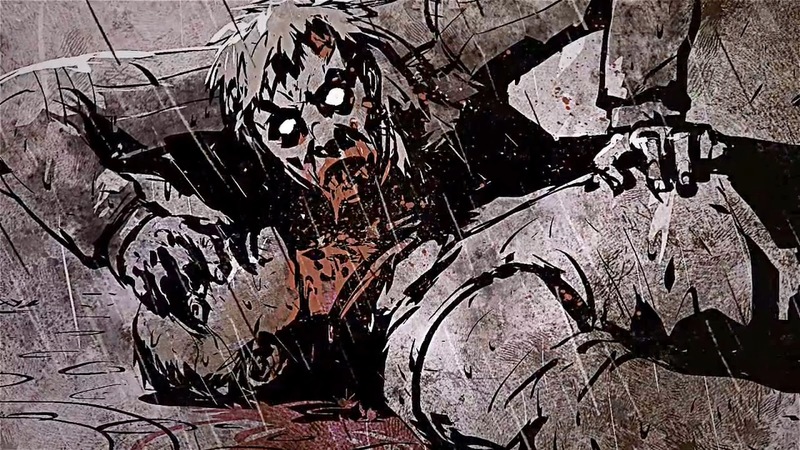 Depth is key here, and Deadlight has it by the gory bucketload. Finding notes and secrets throughout the world mean you that you learn about its downward spiral, and for those that love the how and why of zombie outbreaks, you’ll want to collect them all. 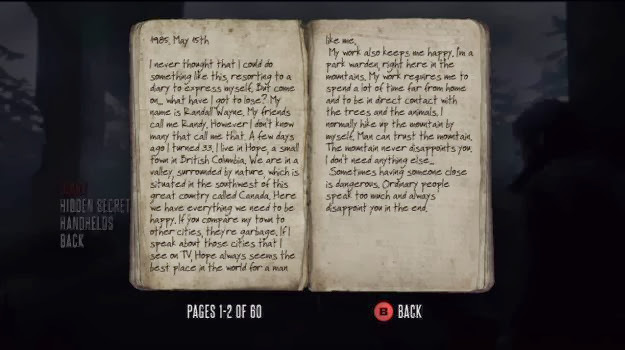 In particular, Randall has a diary that fills up as you collect pages, and gives insight into his life pre-walking dead through to present day. You can also discover little things about people, and corpses, that you find along the way, which aid in fleshing out the world around you. After completing the game, there are also a few reasons to head back into the decaying locales of Deadlight. Not only is it worth returning to collect anything you missed the first time around, but after the credits roll, Nightmare Mode is unlocked. This gives you the option to play through the game without it ever saving. While it doesn’t actually add anything new, it gives the ultimate zombie slayers a way to prove their worth. As an added bonus, there are also extras available, which include development art, ‘making-of’ videos, and assorted trailers and videos from the game’s launch. All of the diary pages and secrets you’ve found can be accessed from here, but unfortunately the cut-scenes aren’t included. As I accidentally skipped one, and then had audio issues with some others, this would have been a nice touch. Looks like it might rain. Where's my inflatables? Deadlight is a thoughtful game that takes you into many different homes and forces you think about what happened there, no matter how brief your stay. The notes left behind, the people that took their own life, all add to the bleakness of the game’s universe. Though it has a couple of minor issues, these don’t even come close to touching the overall experience, and here is a zombie game with a real depth that is lacking in many others of the same genre. This follows over to the narrative, which I’ve mainly avoided for fear of spoilers, and would highly recommend you experience for yourself. All I can say is: Beware the New Law. Beware the shadows. Asylum is the point-and-click indie-horror in development by Senscape, a studio brought together by Agustín Cordes, the twisted mind behind the award-winning Scratches. It drags you kicking and screaming into the decaying walls of the abandoned Hanwell mental asylum, where you will spend around 15 hours being subjected to nail-biting terror until you most likely desire your own padded cell. Though I didn’t spend very long with Asylum – the interactive teaser is only a couple of minutes long – there were a few things I couldn't help but be impressed by in that time. The most notable being the outstanding visuals, sound design and voice acting. Beginning in the asylum’s canteen, you are greeted with the all-too-real sight of filthy walls and rotting food, with swarms of flies buzzing incessantly nearby. When you’re getting annoyed by virtual flies, you know they sound good. This quality remains consistent across the board from the creak of a door, to the spoken thoughts of the nameless protagonist, and, unfortunately, right through to the insane mutterings that seem to be coming from further down the corridor. What happened to abandoned asylum? "We asked for a room with a sea-view..."
After coming across a number of newspaper clippings that detailed the decline and rumoured tortures of the asylum, I was left thinking that there will be many gruesome stories and secrets waiting to be found throughout the game, if you have the guts to look for them. Personally, I’ve always thought something scary can be made even scarier when you’re given the chance to delve further into the inner workings of it, and I hope this will be the case with the horrors of Asylum. 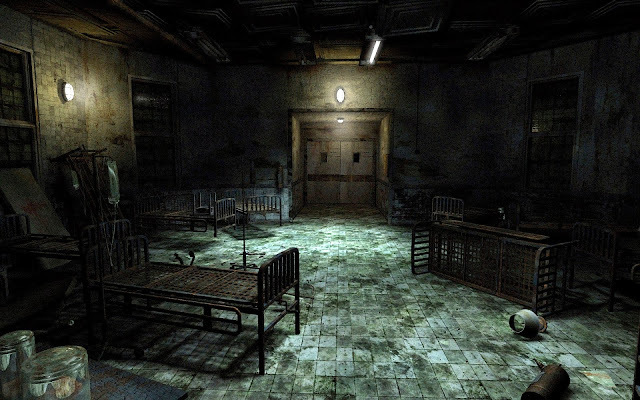 One of the most disturbing facts about this game is that its setting, Hanwell Asylum, is a real mental institute that still treats those with mental illnesses to this very day. 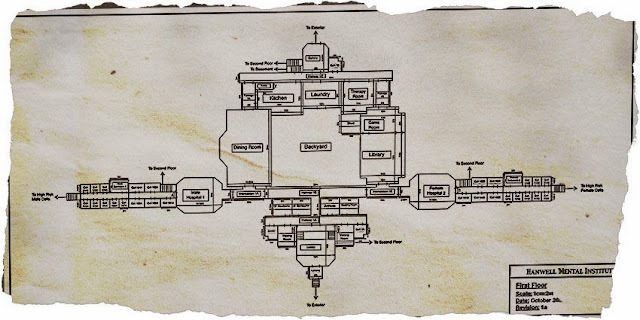 During my time with the teaser I found a map of the first floor of the building, and after researching Hanwell Asylum, discovered that it’s the exact layout of the real-world location. Every door you walk through, every room you enter, and every corridor you navigate is as real and you or I. However, I’m hoping for the sake of the patients that the bloody hand-prints on the walls are for the purpose of the game. Over 100 luxurious rooms of terror. After getting a brief look into the ruins of the mental institute, and the fear it managed to instill in just a few short moments using mainly sound and my own imagination against me, I am looking forward to seeing more of Asylum closer to its expected December release date. What’s Christmas without a few things that go bump in the night, anyway? If you’re feeling daring, and have a couple of minutes spare, walk the halls of Hanwell for yourself here. Looking for a slightly longer post to satiate your thirst for horror? Keep an eye out for my review of Deadlight later this week, or check out my recent review of Kraven Manor. I'll also be playing and reviewing Cordes’ Scratches in the very near future – thanks to the Steam Halloween sale – so I’ll be able to give you a better insight into just how cruel Cordes is, and how far he’ll go to make us squirm.